I started a daily blog some time ago. I was posting it on my Blogger site and then would copy that and paste it here. Doing both! A lot of work. If you are reading this, please instead go to my Blogger site. Click here to be transported directly. I will still be sure to count the comments made here for the painting contest, which has been extended. 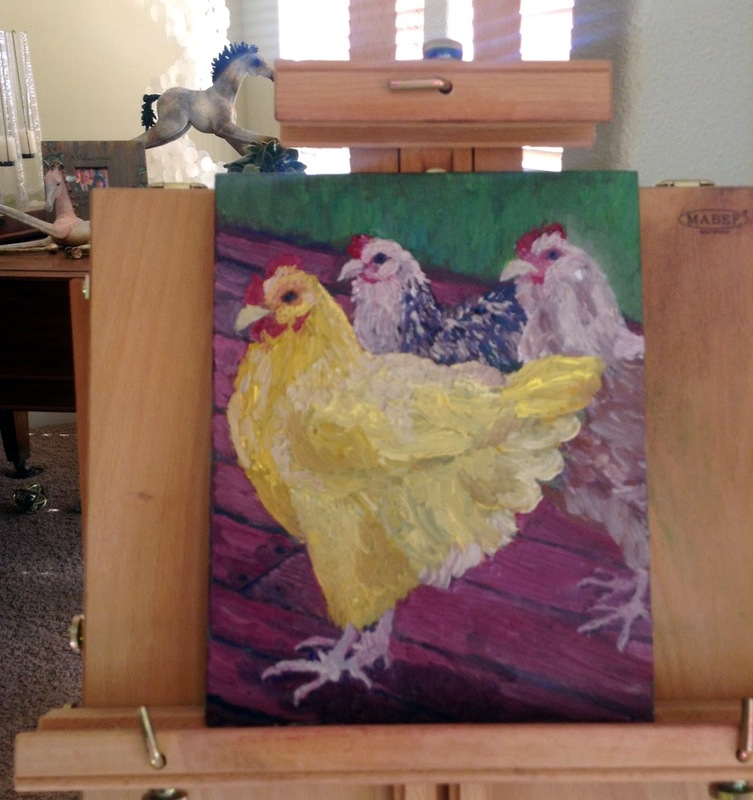 WIN an original oil painting ! Just so you all know. I am gearing up a campaign for getting comments on my blog and will be sending out a newsletter to everyone on my mailing list to comment on my blog entries so far and send out word about this blog to everyone they know. I hope all my friends on facebook will do this too (hint-hint). Whoever comments the most in the next 3 months will receive an original oil painting – painted in my own unique style…that I would even have a painting style at this point is questionable…but I digress. Of all the paintings I paint in the next 3 months (and my goal is to paint one a week) who ever has made the most comments on my blog during this period of time will get to choose one of those paintings. Here’s an example. I painted it today. It is of a few of our chickens, Sally, Matilda, and Mickie. The chickens stand on our back porch several times a day and petition for bread. I convinced them to put down their little “Give Us Bread NOW” signs so I could photograph them and bribed them with bread to pose off and on during the day. These paintings won’t be masterpieces since, hey – I’m a professional sculptor…and I paint for fun. And these won’t be large (no bigger than an ipad) but they will be original and you, most frequent blog commenter, will get to choose! How fun is that? I will post photos of what I paint as I go forward with future posts. And, yes, whatever you pick will be framed. I am doing this to thank whoever comments the most often because comments are so important to the successful readership of a blog. This also keeps my sculpting brain working well…cause, you see. When painting I am taking the 3d world (aided with photos sometimes) and recreating it in 2d (a creation that hopefully looks 3d in 2d) and when I sculpt, I sculpt primarily from photos…which is the reverse – so I take a 2d representation of a 3d object that I am recreating a 3d object from that. This maybe makes no sense unless you are an artist (and it maybe makes no sense if you are an artist)…but somehow it keeps me more creative…maybe it balances my brain :). Of course I’m doing this too to generate more and more interest in my sculpture and in me as an artist over time. There is that. Artists can sit in their studio and create…but that doesn’t do anything to share their work with the rest of the world. I want to share what I do with all of you. I want this blog to be one way of doing that. Sorry about the evening writing of this today…I’ll have more in the morning and a newsletter out tomorrow for my newsletter readership. If anyone reading this would like a newsletter, please go to my website and sign up or drop me a note in FB or in email and I’ll put you on my mailing list. LOVE the painting, HATE the frame! Hmmm. I don’t know how much I agree with that. If someone took one of my sculptures and put it on a different base I would have zero problem with that. When it comes to basing my work – it is thought out, sure. But my intent is to try to make it as undistracting (new word) from the sculpture as possible. But once someone owns one of my sculptures if they have another thought that, to them, might improve the piece in the context of it’s new setting, it certainly doesn’t affect the value of the sculpture itself to change that aspect of it…as the base (in the case of my sculpture anyway) is not part of the composition of the piece. But what if a frame on a painting is distracting and not complimentary to the piece? (IMHO of course). 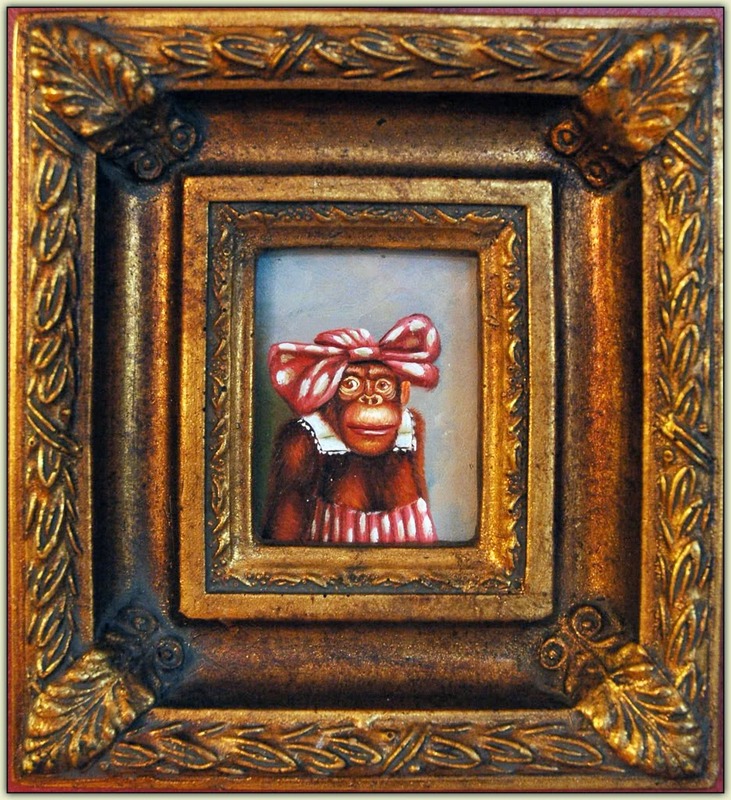 Check out this frame around this painting of a monkey. (No, this is not what we bought last weekend and this is not a piece of art we own). Artists? If someone buys one of your framed paintings and wants a different frame or re-frames it themselves, how to you feel about that? I have been reading a digital copy of Birge Harrison’s book “Landscape Painting” (a wonderful little book by the way) and in it he has a section “On Framing Pictures” and I thought I would share an excerpt from that chapter today. (I’m paraphrasing of course since the book was published in 1910 and “over the top” probably was not a figure of speech back then). He maybe had something like the frame above in mind…which is for a mirror.. 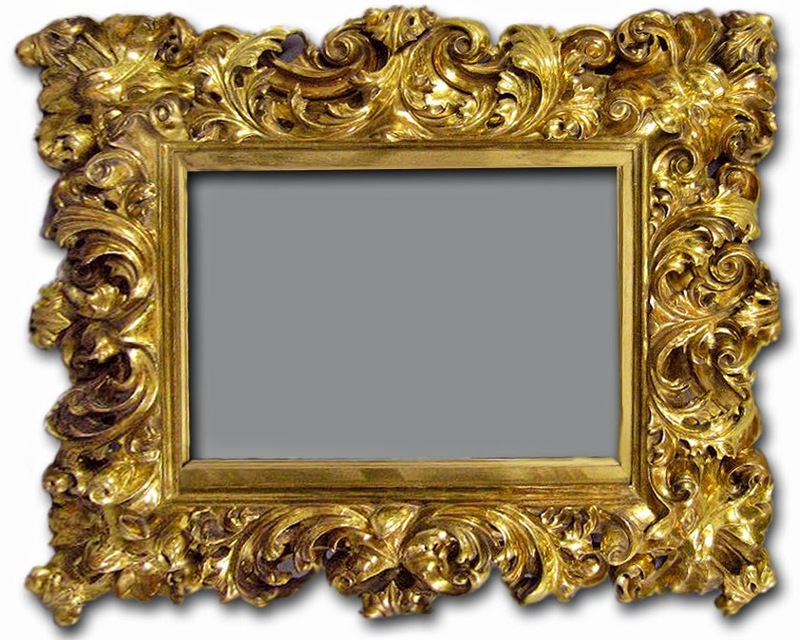 Seems like the most ornate frames I have ever seen were for mirrors, come to think of it. Oh gosh. Here’s a deep thought. Is the reflection of reality so uninteresting that framing it as fancy as possible is necessary? I would love to hear from other artists how you frame your work. Do you make your own frames or do you have a supplier? If you make your own, how did you learn? and do you have any instruction out on the web that we can check out? And if you have a supplier, who is it? Hello art collectors! What are your frame preferences? I’m off to continue do my best to create a beautiful day. Every day that I sculpt I have accidents that happen. 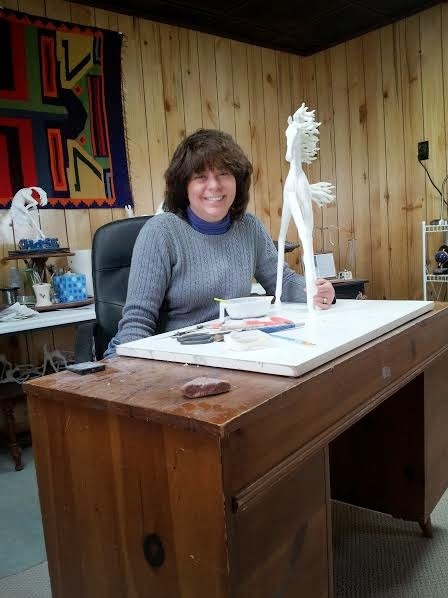 Occasionally a sculpture will leap off my worktable and break into several pieces and – since I’m working with clay that is made out of paper and dries in the air – things happen to the sculpture all during the creating process. For instance, once the sculpture is started and I add clay to a certain area, that new wet clay is placed onto the existing dry clay and while it is drying, moves portions of the sculpture around. When I first started working with this material, I tried to correct these “accidental” rearrangements of my sculpture but now I will consider these accidents to see if they actually help the design or make it unique in some way. I have decided that the accidents are sometimes a form of unique guidance and serendipity and welcome many of those accidents as part of my creative process. Many artists today and throughout history knew accidents were often a good component in helping them create their works. Of course some accidents will just feel like a catastrophe! legs broke; some in two places! What do you think? Do you believe that art doesn’t “just happen” because of perfect planning and perfect control – it also happens by seemingly random accidents sprinkled in? Check out the quotes below (thanks to art-quotes.com) from artists regarding accidents in their work. Which is your favorite? It’s time for me to get to work. I hope your (and my) art accidents are all good ones today. It’s Monday, June 23 and I have dedicated myself to writing a blog entry every day. I do not consider my life to be what anyone would describe as exciting so this could be the most incredibly boring blog ever if I just talked about my life. What I think is important is to connect with other artists. Maybe other artists are also feeling that their life is also not incredibly interesting but they are nevertheless also developing their art career and are also learning more about how professional artists structure their days from day to day. I don’t want this blog to be just a one way dialogue and want to hear from other artists (and any creative business person/entrepreneur) too so we all can learn from one another. What works in your life? You are always learning how to manage life and create the best art you can…just like me. It isn’t easy. So that is what I will talk about – each day what I do to create art and make what I do better and the other adventures into art that I embark on and the other things that just happen that enhance or interfere with that. I have been refreshing my art education since the beginning of the year. I spend a portion of the beginning and/or end of the day learning something about art and artists through history. This must come up (art history) just with the every day sketching I have been doing…I have been involved in the study of values and perspective, for instance – and how can the study of value and perspective not lead me to learning more about da Vinci? I have been trying to shore up the holes in my art education in other ways – for example, I have been learning more about oil painting. You can’t paint well if you can’t draw well…I think. I want to paint some scenes from around our property to frame and hang in the living room which is currently being remodeled a bit to make it more of a gallery space for my sculpture. So I have been on Stapleton Kearns blog and he is fantastically educational not just about painting but about art history. These things and more (to be shared in future posts) have been important inroads to keeping me motivated to sculpt more and to always think of myself and my work as truly a professional endeavor. I hope to hear from anyone out there, all of you artist/entrepreneurs. What do you do every day? Do you try to continually educate yourself about art and what is it you do to keep your work it’s best and to keep your muse alive? Creative people are humble and proud. Creative people tend to be both extroverted and introverted. Creative people are rebellious and conservative. How creative are you? I frequently find myself thinking about whether I am an artist or an entrepreneur. I am simply trying my best to create my own unique path. It is safe to say that more and more entrepreneurs are artists, and artists of all kinds are entrepreneurs. And the trend is only on the rise as all things (art, science, technology, business, culture, spirituality) are increasingly converging. Creativity is the common theme that drives both entrepreneurs and artists alike. But creative people are often also paradoxical. Over this past Labor Day weekend, I found myself reading excerpts from distinguished professor of psychology and management Mihaly Csikszentmihalyi’s (pronounced me-HIGH chick-sent-me-HIGH-ee) seminal book Creativity: The Work and Lives of 91 Eminent People (HarperCollins, 1996). 4. Creative people alternate between imagination and fantasy, and a rooted sense of reality. Paradoxical or not, what I have learned most is that there is no formula for individual creation. As Mihay says, “creative individuals are remarkable for their ability to adapt to almost any situation and to make do with whatever is at hand to reach their goals.” So, more than anything else, what it takes to be creative is resourcefulness and the courage not to give up. The Oglala Lakota tribe has many stories about the wind and this one is my favorite. Wind is an almost constant companion out here on the Colorado prairie and it can change directions many times in one day – causing clouds and weather to circle us much of the time so that no rain or snow will fall. We can see it happening from a distance all around us and feel the wind in a big way – but sometimes wind is the only thing that happens. Seeing the rain and clouds and rainbows that form around us because the wind can’t seem to decide on one way to blow for long – is one of the most beautiful things about where we live. The Lakota Winds series is meant to commemorate that aspect of our environment. It is a beautiful way of explaining why there are the seasons of the year and the cycles of the warming, flowering and freezing of the earth. Before the creation of the world the South wind (Okaga), the North wind (Yata), the West wind (Eya), and the East wind (Yanpa) dwelt together in the far north in the land of the ghosts. They were brothers. The North wind, the oldest, was always cold and stern. The West wind, next to the oldest, was always strong and noisy. The East wind, the third, was always cross and disagreeable. The South wind, the next to the youngest, was always pleasant. With them dwelt a little brother, the whirlwind, (Yumni) who was always full of fun and frolic. The North wind was a great hunter and delighted in killing things. The South wind took pleasure in making things. The West wind was a helper of his brother, the South wind, and sometimes he helped his brother, the North wind. The East wind was lazy and good for nothing. The little whirlwind never had anything to do, so he played all the time and danced and made sport for his brothers. After a long time, a beautiful being fell from the stars. Her hair was like the light and her dress was red and green and white and blue, and all the colors, and she had decorations and ornaments of all colors. As she was falling, she met the five brothers and begged them to give her some place to rest. They took pity on her and invited her into their tipi. When she came in the tipi, everything was bright and pleasant and all were happy, so all the four brothers wanted to marry her. Each asked her to be his woman. She told them that she was please with their tipi and would be the woman of the one who did that which pleased her the most. So the North wind went hunting and brought her his game; but everything he brought turned to ice as soon as he laid it before her, and the tipi was dark and cold and dreary. Then the West wind brought his drum and sang and danced before her, but he made so much noise and disturbed things so much that the tipi fell down and she had hard work to raise it again. Then the East wind sat down by her and talked to her so foolishly that she felt like crying. Then the South wind made beautiful things for her. She was happy and the tipi was warm and bright. She said that she would be the South wind’s woman. This made the North wind very angry for he claimed that it was his right as the oldest, to have the beautiful being. But the South wind would not give her up. The North wind and South wind quarreled all the time about her and finally the South wind told his woman that they would go away so that they might live in peace. They started, but the North wind tried to steal her. When she found what the North wind was trying to do, she took off her dress, spread it out, and got under it to hide. When North wind came to the dress he thought that he had found the beautiful being and he embraced it, but everything on it grew hard and cold and icy. He heard the South wind coming and he fled to his tipi. The South wind found only a cold hard thing like his woman’s dress but he could not find the woman so he went back to look for her. When he had gone, the North wind came again and said to the woman, “I know you are under this dress and I am coming there also.” So he went to the edge of the dress, but the woman spread it out farther that way. Then he went to the edge at another place and she spread that side out. He kept going from place to place and she kept spreading her dress wider and wider until it became so wide that there was no end or side left. Then he heard the South wind coming again and he ran to his tipi. When the South wind came again he examined the dress and found that it was truly his woman’s dress and then he knew that the North wind had embraced it. He called loudly for his woman and she answered that she was under the dress and then he knew that the North wind had embraced it. He called again for his woman and she answered him that she was under the dress, but that she had stretched it so wide to keep away from the North wind, that there was neither a side or an end to it, so she could not get out from under it. Then the South wind followed on the trail of the North wind until he came to the tipi where he found him boasting to the other brothers of what he had done. The South wind went in and reproached his brother. They quarreled and finally fought and the North wind was about to conquer when the West wind rushed in to help the South wind and they conquered the North wind. They could not kill him so they bound his feet and hands and left him in the tipi. The other brothers all sided with the South wind and determined to live no longer with the North wind. So the West wind went to live where the sun sets, the East wind where the sun rises, the South wind went opposite the tipi of the North wind far as he could go. The little whirlwind was too small to have a tipi of his own, so he lived with the South wind the most of the time, but part of the time he was to live with the West wind. The East wind was so lazy and disagreeable that he would not even visit him. The south wind came again to his woman’s frozen dress. He called her and she answered, but she could not come from under it, neither cold he go below it for it was spread so wide that there was no end to it. He journeyed to his brothers’ tipi. They came and helped him; they warmed the dress, but it was still ugly and like a dead thing. When his woman found that he was warming her dress, she thrust bright ornaments through it and it was again beautiful with green and red and blue and all colors. So the three brothers, the South wind, the West wind, and the East wind continued to warm the dress, but the East wind was so lazy that he only worked occasionally in the evening. Little Whirlwind was too small to do much work but he danced about over the dress and threw things in the air and tried to keep the South wind from grieving over his loss. The South wind grew weary with grief and work and went to his tipi to sleep and left only the West wind to guard the dress. Then the North wind freed himself and came. He and the West wind fought furiously and the North wind was about to conquer and had destroyed all the ornaments on the dress and made it hard and cold. When the North wind came, little Whirlwind sled to South wind’s tipi to tell him. He found South wind asleep and could not wake him. He tried and tried again and again, but could not wake him, so he ran all the way to the tipi of East wind who was sitting looking on at the fight between his brothers, intending to take sides with the one who won. Little Whirlwind persuaded East wind to go with him and wake South wind. When South wind was told what had happened he came in a great rage to the help of his brother, the West wind. They fought all over the dress and finally North wind was driven back to his tipi, but he would slip away at night and embrace the dress and make it hard and cold until he was bound again. Then the South wind and West wind had to warm the dress again and the woman under the dress had to push the ornaments through it again. Thus began the warfare between the brothers which continues to the present time. The material I use to sculpt with is made by Padico in Japan and there is only one distributor of it in the US. It is typically sold in craft stores – although we purchase it in bulk directly from the supplier. It is made from paper pulp, talc, water, and some binders and whatever else it is – is a mystery- the formula for it is proprietary. Most sculptors sculpt with chavant like clays – the kind that never dries. When I started sculpting I used the same. I hated it. Sculpting something that is permanently attached by a pipe to a board is frustrating to me, partly because of my eyesight, partly because of my temperament. The material I use has it’s own unique characteristics and challenges but sculpting with it adds a unique element that makes the sculpture I do look different in bronze than all the sculpture originally made with non-drying clay. It has a bit of a life and will of it’s own. I am very nearsighted so I wear glasses or contacts to correct that. For me it is a very good thing though – for sculpting – because it means that (even though I am of an age where most people need reading glasses to see close up) my close up vision is really really clear at about 9″ from my face. If a sculpture is attached to a board I cannot see parts of it well. So I have to be able to hold a sculpture in my hands for most of the time to work on it – this cannot be done with non-hardening clay – as I would just end up burying my fingers in the very thing I am trying to create. Non-hardening clay is also very heavy and the paper clay I use is extremely light so the long legs of the horses are not too weighed down by their bodies. The reason many sculptures are being done at one time is because rather than image just one horse, I imagine them in groups. I saw the house horse series (look, relax, itchy, leap, watch, and step high) all in one day and made their wire armature forms that same day before I could forget how they were to be. They were imagined in 2010 and the last one has just been finished. It seems to take FOREVER to make them this way. I know galleries enjoy prolific artists – I guess I would not be that – but consider that “prolific” and the annihilation of creativity very often walk together. I work on them until they are how they are supposed to be and that can take time, most certainly takes inspiration and an uncluttered undistracted mind. For example, I can re-carve a face 3 or 4 times until I know that is the face that sculpture is supposed to have. I once was very determined to be a rich and famous artist. But I have been learning that’s just common ego – doesn’t most everyone in their head think that being a rich and famous this or that is what they must be to be seen and respected in the world as “somebody”? But polluting what happens in the only time I know I have because I am “working” to get to a place that may never be – also gets in the way of creativity (and happiness)…and is something that could cause the work of any creative endeavor to become stagnant, uninspired, and derivative. I am asked what is the style of my sculpture. I respond with – what do you see? Do you see an “-ism” there? Impression-ism? Expression-ism? a school of this or that? Art is it’s own language; to describe art with another, different language – is an act of reductionism. Translate a Haiku written in Japanese into English and you invalidate its beauty. There is freedom that comes with the belief that the sculpture I create does not belong to me – that it belongs to the world. I believe all art that is made public belongs to the world and is meant to enhance everyone’s experience of being…here. That means the world will decide what happens to it until the day it becomes a part of the history of art…long after I am gone. “Step High!” just got cast and colored with her patina – and she came out gorgeous! Step High! She is the last horse of the first series. I got the idea for the patina colors when Mark and I were driving to Ketchum last November on the way to see one of our (grown up) children for Thanksgiving. We were driving by a part of Idaho were there are old lava fields and there was a plant growing in there that looked like it might have been a sage but had branches the color of dogwood branches – sort of a reddish purple eggplant kind of color and then the sage green of the leaves above – so there was this striking color combination of the black lava dirt the purpley red color and the sage green and I thought – I wonder if my patineur could do that maybe with some black veining running through it. I know I freak her out every time I tell her what I want a patina to be – but she always tries to give me what I have in my head (no easy task) and does just a wonderful job! Next Step High! will get a nice black marble base and then she will be ready to be previewed for the very first time at Rogoway Turquoise Tortoise Gallery for the art show on the 20th of April! Happening Events and New Events Coming Up! What could be better than investing in art and receiving a tax deduction in the bargain? Icing on the cake! Right now my sculpture is at the Cheyenne Frontier Days Old West Museum. Founded in 1978, the museum is a 501(c)(3) non-profit organization dedicated to educating the community about the history and culture of Cheyenne Frontier Days from the event’s earliest inspiration to its present celebration. On April 20th will be a fantastic show featuring a fantastic book just being released titled “Horse Sanctuary” a book by journalist Allison Milionis profiling thirteen sanctuaries that rescue and care for abandoned or mistreated equines, and in some cases, rehabilitate them for adoption or new careers. There is a forward in the book written by Temple Grandin and the beautiful photography is by Karen Tweedy-Homes who will be at the show with me to sign the book and offer her framed and unframed photography to the lucky people who can come to the gallery on this day! Mark and I will be there – of course, and all of my sculpture will be there available to you for the opportunity to, not only invest in some beautiful artwork and receive tax benefits, but help an organization that does such wonderful work on behalf of abused and neglected equines. A portion of both my art and Karen’s will be donated to Equine Voices.